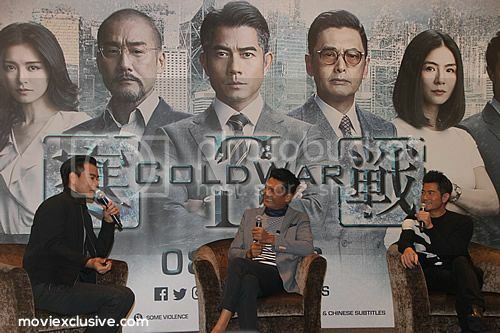 Aaron Kwok, Chow Yun Fat and Eddie Peng may spend a lot of time in ‘Cold War 2’ glaring at each other, but judging from their lively banter during the press conference in Singapore as part of their star tour, it was a very different atmosphere on and off the set. Led by the ever-jovial Yun Fat, Aaron and Eddie took turns to take jibes at each other to cheers and laughs from the crowd of reporters gathered in the Marina Bay Sands ballroom to catch a rare glimpse of three A-list actors on the same stage. From the very start, it was difficult to get a serious moment as Yun Fat jokingly proclaimed that he did not understand the story of the movie even after filming, so much so that he had to go through the story with his co-directors Longman Luk and Sunny Leong multiple times! “I’m not too sure what the whole story is too!” Aaron chimed in. “But I’m very clear, and if you want to know, you’ll have to watch ‘Cold War 3’!” said Eddie, a tacit allusion to the fact that (well) his character may very well live to see yet another sequel happening. For the uninitiated, Eddie plays disgraced cop Joe Lee, who is unveiled to be one of the conspirators behind the missing Emergency Unit (EU) van in the first film that precipitated the titular rescue operation in the first place. Though that already placed him at odds with Aaron Kwok’s then-Deputy Commissioner Sean Lau previously, it is only in this sequel that their conflict comes to the fore (hands up if you get the pun about Eddie!). Oh yes, the newly promoted Commissioner Lau is forced to take things in his own hands when his wife is held hostage by Joe’s accomplice demanding his release, a move which gets him impeached by the Legislative Council. It is in a scene where Aaron personally escorts Eddie on a cat-and-mouse game with the latter’s accomplice that the two actors reminisce how it took a little too real. “I remember one particular scene where I was handcuffed and Aaron literally banged me against the side of the car and shoved me into the back seat,” said Eddie. “He didn’t stop until the directors yelled ‘Cut!” Aaron recalls that scene just as vividly, adding that it was a single take that he did not want to disrupt until he got the cue to stop. “[Aaron] did it deliberately, I’m sure!” joked Yun Fat, who lamented that he did not have the chance to share a scene with Eddie this time round. 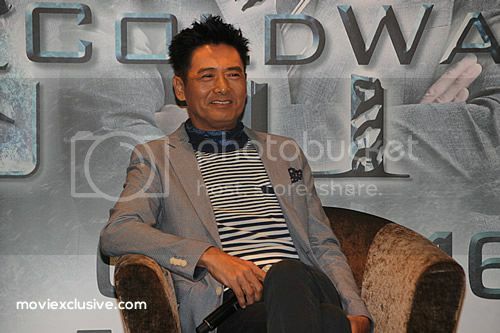 Nonetheless, the veteran Hong Kong actor was very glad to star in a movie with Aaron and Tony Leung Ka Fai, the former a dancer and the latter his acting classmate during his TVB days; in fact, it was Yun Fat who sought out Edko Films’ boss Bill Kong and the directors for a role in the sequel because he loved the original so much. 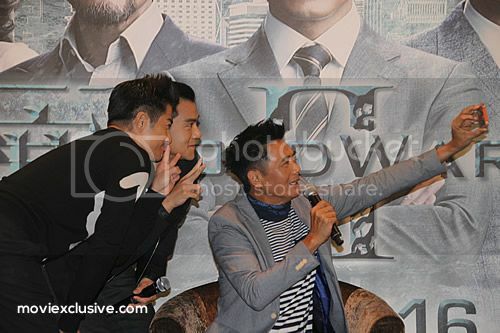 Yet if the press conference wasn’t as much a demonstration of Yun Fat’s acting ability as it was of his quality as an entertainer, it was also a surprising testament to his reputation as the ‘King of Selfies’. Quizzed not once but twice by two different reporters on his title, Yun Fat explained that he would rather take photos of himself than have others take ‘bad photos’ of him. “As the Chinese saying goes, ‘die by your own hands rather than being at the mercy of others’,” said Yun Fat. Pressed on giving some ‘selfie’ tips to newbies, Yun Fat gave three – one, to extend your hand fully when taking a ‘selfie’; two, to put yourself in the centre so that the people to your left and right will make your face look thinner; and three, to shoot from a high angle so your chin would not show – and oh, though he doesn’t use an iPhone, he easily rattles off functions such as the ‘burst’ mode. But most impressively, Yun Fat gave all the reporters in the room a treat by going around taking selfies with each one of them in turn, in order to prove his point that it really isn’t anything too difficult or time-consuming. 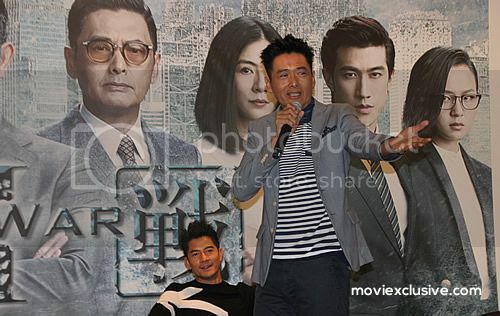 With Yun Fat in fully casual mode, it was up to Aaron and Eddie to try to whip up interest about the movie. Aaron was quick to point out a very special action sequence which took place inside a long underground tunnel and involved explosions and gunfights. “It was probably the most dangerous scene for me because of the stunts involved, including being in very close proximity to a controlled explosive device and having to roll on the floor with shrapnel.” In his opinion, the scene is also special because it is probably the first to be set in such a location in Hong Kong. Yes, it is no spoiler to say that Aaron’s character lives to see the day – or to be more specific, the light of yet another sequel should that materialize. And why not really; as we say in our review, and as evident in that brief one hour of the conference, there is more than enough life, energy, charisma and goodwill for Aaron, Yun Fat and Eddie to go at each other one more round.